The following kids shoe size chart overview is a handy Children’s Shoe Sizes guide for you. Kids shoe size conversion from US sizes to EU, UK or MX sizes is a challenge. So, if you have children in their growth spurt years, you might want to bookmark this kids shoe size chart by age page. It will help you also in future. 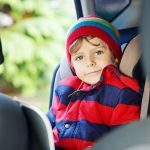 Why are good fitting shoes for kids important? To find the right shoe size for your child, measure the foot length from the heel to the longest toe. For the width, measure the widest part of the foot. Do this for both feet. It is best to measure your child’s feet in the afternoon as they expand during the day. Always update your child’s shoe size measurement (preferably every 2 months) and keep it handy. Buy shoes with a little extra room of 0.5-0.7 in. for comfort and growth. Children’s feet grow fast! Never buy shoes that are too small for your child. They are an unhealthy for a child’s growing feet and hinders proper circulation. Consider your child’s typical activities when choosing a shoe design. For example, running shoes are suitable outdoors. Boots are great for the rainy season. Black leather shoes are meant for school if they’re required to wear uniforms. Children’s shoe sizes will still vary even for the same age group. 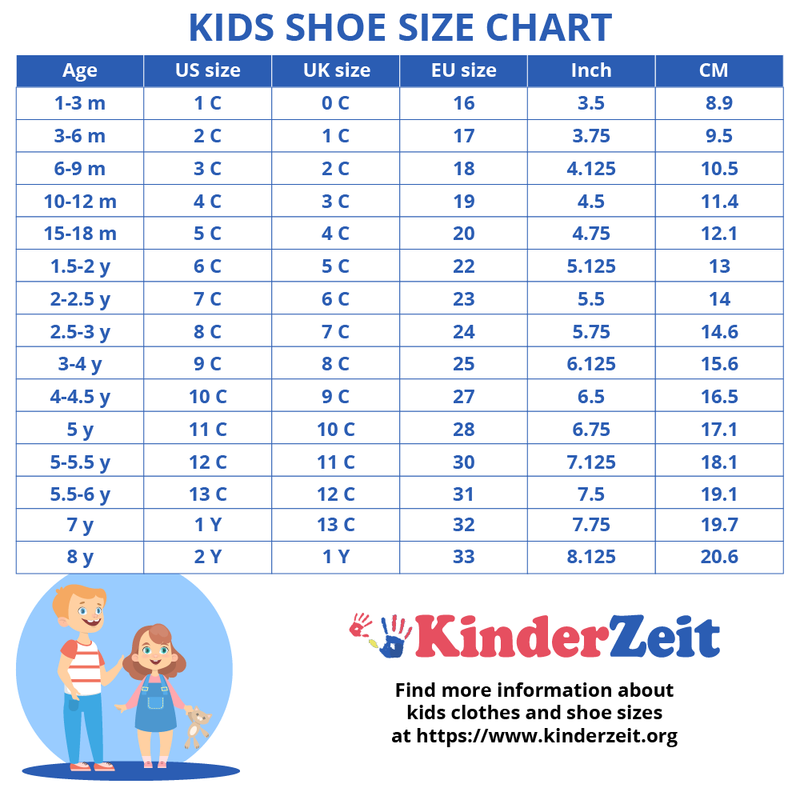 One 2-year old kid can have a bigger size than another kid of his same age, but for general sizing purposes, the following Kids Shoe Size Chart by Age lists the typical measurements of each age. More information about baby shoe sizes are here. Note: both girls’ and boys’ shoes follow the same size standards, the only difference is boys’ shoes are a little wider than girls’ shoes. Kids Shoe Size Chart for US shoe sizes and foot length in inches and centimeters. This article on Asian children’s shoe and clothes sizes might also prove useful. Here is a handy kids shoe size conversion chart by age for you. Place your child’s feet on a blank piece of paper on a flat surface. Using a pen or marker held up straight at 90 degrees angle, trace around the shape of the foot until you have an outline. Place a ruler against the outline and measure from the highest tip of the toe to the end of the heel to get the full length. Keep the ruler straight, mark both endpoints first if it helps. Take note of the measurement in inches. You can also cut from around the traced outline and keep the paper handy for when you go shopping. Our feet get wider and longer towards the end of the day, so measure your child’s feet in the afternoon or at night. Trace the feet while the child is standing up, sitting down may affect the accuracy of the size while being taken. Take measurements for both feet to cover differences in length. If there is any, use the longer measurement. Update your measurements every 2 months because a child’s feet can grow faster than you would notice! When buying closed shoes, make room for growth (0.5-0.7in) if you want them to be able to use it longer. No outfit will ever be complete without the perfect pair of footwear to go with it. For parents, however, care must be given when choosing kids shoe sizes since kids can outgrow their shoes pretty quick. This means that buying an expensive pair in exact size only to be used for a few months will not be worth it, which brings us to another important thing to note: make sure to check every few months if their shoes still fit right. We all know how frustrating it feels to have to wear ill-fitting shoes, but for children, the effects can be more detrimental to their health the longer they are stuck in it. 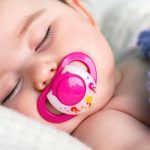 Oftentimes, they may not even feel the pressure early enough to tell you especially since kids’ shoes are made with soft inner lining for cushion. Children’s softer feet are also more prone to deformities and misalignments, do not forget. Yes, it’s true, good shoes, good feet. So, start them early! How to find the right fitting shoe sizes for my kid of certain age? Many brands specialize in designing and manufacturing children’s shoes. Some of these brands focus on providing comfortable shoes using skin-friendly materials, which parents will surely appreciate. The most popular brands among kids are Crocs, Clarks, Mini Boden, Bobux, Step2wo, New Balance, Skechers, Nike, Adidas, Converse, Vans, Under Armour, Steve Madden. In general, a child’s shoe should be made of breathable materials to allow proper circulation. Think of mesh and leather that feels comfortable to the feet. Lightweight and flexible shoes are also recommended since kids move a lot. For safety reasons, children’s shoes should have a rubber sole to avoid sliding or slipping as much as possible. Avoid buying stiff shoes! This doesn’t really need an explanation, does it? This does not only trap circulation but hinders growth and movement as well. Have mercy on those little feet! 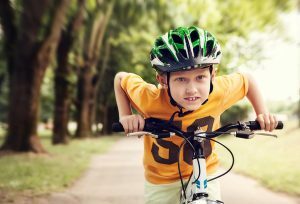 Consider your kids common outdoor activities. If your kid is a runner, you are better off giving them running shoes. If they play a lot and engage in high-impact activities, consider a pair with a good shock absorption pad and durable outer soles. #1: As much as possible, do not get the inner sole wet or soaked. This can weaken the glue over time and shorten the lifespan of the footwear. Use foot disinfectant spray instead. #2: When cleaning dirt, use a damp cloth to wipe stains away. For more stubborn dirt, use a brush and soapy water. #3: Do not use bleach to avoid damaging the material and its color. #4: Allow at least 24 hours for the shoes to dry completely before wearing them again. Wearing damp hopes will only cause the growth of bacteria and fungi on both shoes and feet. A shoe for every occasion. Well, that’s more than just a fashionista’s excuse to buy more shoes. For kids, it’s more like, a shoe for every activity, right? Besides, proper shoes also mean more freedom in movement and better comfort, just how footwear should be. Running Shoes – this can be your child’s typical outdoor footwear for most of their activities. Boots – keep those feet from getting wet during the rainy season by getting them a trusty pair of rain boots. School Shoes – black shoes can be stiff depending on the material. Since kids often stay in school all day, choose comfortable leather shoes that wouldn’t hurt when worn for hours. Trainers – a kid’s typical play time can seem like a sports activity with all the jumping and running they do. Make sure their footwear can keep up by putting them in a durable pair of trainers. Party Shoes – children’s parties will come left and right especially once they enter school and meet more friends. Keep them stylish but comfortable in some slip-ons that they can match easily with their party outfits. It is understandably tempting to always buy your child’s shoes according to the many styles you want, but do not forget the importance of a good fit not only for their comfort but for their health as well. Find here more information about Kids Pants Sizes. Other clothing sizes for kids you can find here. Fashion isn’t just for adults, or women, for that matter. 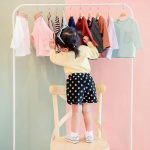 If you are one of the many fashion-conscious parents of today, you will probably find yourself spending more time on your kid’s style than you do for yours. That isn’t really bad, considering kids won’t always be kids anyway, and snapping cute photos of them every now and then will always be worth it especially in the future. Here you can find more information about boys clothing sizes. 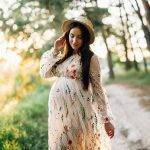 Here you can find more information about girls clothing sizes.